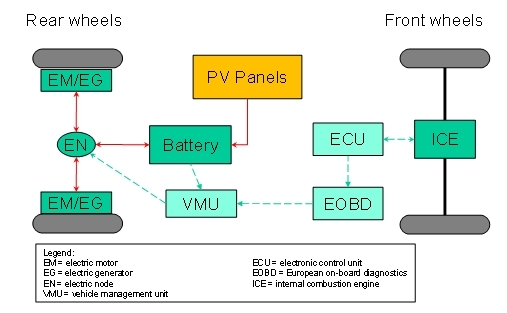 This patent focuses on the development of equipments, along with associated techniques and methodologies, aimed at converting conventional carsinto hybrid solar vehicles (Mild-Solar-Hybrid). Mild-hybridization will be performed by installing in-wheel electric motors on the rear wheels (in case of front wheel drive) and by the integration of photovoltaic panels on the roof. The original architecture will be upgraded with the storage device (battery pack) and an additional control unit to be faced with the engine management system by the OBD port, and not interfering with the original engine control unit.